The Serpent's Wake is a ship docked in Anvil Harbor. 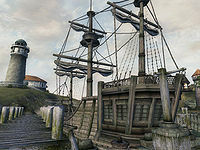 The ship has just returned from a trip to Summerset Isle to collect a family heirloom for Varulae, the ship's owner, and is currently docked south of The Flowing Bowl and west of Anvil's other ship, The Sea Tub Clarabella. 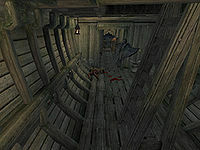 Back in Anvil, the whole crew got slain, and as a result, their spirits are now haunting the ship. Varulae asks you to retrieve her heirloom which is located deep inside the ship, as she is too afraid to do it herself. The Serpent's Wake is divided into three levels; The Serpent's Wake is the captain's quarters, level with the top deck. The Mid Deck serves as sleeping quarters for the crew, and the Cargo Hold is used for storage. The entrance to the captain's cabin holds two crates and a cupboard that contain clutter in the southeast end and a hatch to the mid deck in the northwest end. The doorway opposite the entrance leads to a bedroom, where the first spectral sailor can be found. 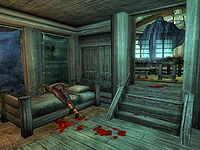 The captain's dead body lies across his single bed in the north corner. A barrel sits in the west corner with a sack on top; they both contain clutter, and the sack does not respawn. Next to the barrel sits the captain's chest, which holds 100 gold, a jade necklace, and possibly a random piece of leveled enchanted jewelry. A second non-respawning clutter sack sits on a table in the south corner. The cupboard in the east corner also holds clutter, and the four steps on the northeast wall lead up to a dining room. The table is set with four radishes, two potatoes, a loaf of bread, a cheese wedge, an ear of corn, and a bottle of mead. Another ear of corn lies on the floor nearby. The entrance to the mid deck is near the northeast end of the ship; only one room lies beyond the entrance in this direction, and it holds a second spectral sailor. A crew member's body lies across a table. Scattered about the room are three barrels, three crates, a sack, and a chest that all contain clutter. On top of one of the crates sits a sack that holds 100 gold, two more gold pieces, a note and a copy of Azura and the Box. Two single beds sit on each side of the room, with a grain sack at the foot of one. Only the sacks here are non-respawning. The hallway on this level has two doorways on one side and another at the end. The three sets of shelves against the wall hold between them two clutter crates and a clutter chest, two non-respawning grain sacks, two pumpkins, and a watermelon. The first door leads to a small bedroom with a non-respawning chest that can hold armor or weapons sitting on top of a chest of drawers that holds clutter. The second door reveals another bedroom with another spectral sailor and dead crew member. A clutter barrel sits on the shelves and the other door leads to the final bedroom. This bedroom has a table around the corner at the end of the room set with a loaf of bread and a tomato. The room at the end of the hall holds the hatch to the cargo hold and two clutter barrels as well as three non-respawning sacks, two with grain and one with clutter. The first room of the cargo hold features another spectral sailor and another dead crew member. Four non-respawning grain sacks lie around the room, as well as a clutter barrel and a non-respawning chest that holds only Varulae's crystal ball, her family heirloom. The next room holds the last spectral sailor on the ship. Three barrels, a crate, and three non-respawning sacks hold clutter, and another non-respawning sack holds grain. Two pumpkins sit on the shelves against the wall. The final room holds the final crew member's body lying across one of five clutter crates. A potion of healing sits on another crate. The barrel here only holds clutter, but the chest can hold armor and weapons, and does not respawn. The shelves against the wall hold a bottle of skooma, a flawed topaz, and a flawed ruby. For more information regarding the assassination of the crew, see the Traitor's Diary. A chest can be found buried in the sand at the bottom of Anvil's harbor, close to The Serpent's Wake. Heinrich Oaken-Hull's dialogue as seen in subtitles includes the line "My ship, the Serpent's Wake, is in for refitting, so I'm high and dry for a while." but as delivered in audio, the line leaves out the name of the ship, becoming simply "My ship is in for refitting, so I'm high and dry for a while." This would seem to indicate that the developers had spotted that the captain was already dead but didn't fix everything. This page was last modified on 19 November 2018, at 04:19.